Since the Revolutionary War, American military men have published troop newspapers to provide amusement, to keep themselves informed, to aid in maintaining morale, and to encourage those engaged in boring or dangerous pursuits. Beginning as informal ventures, these papers received official sanction as high command began to realize their morale benefits and eventually became an accepted adjunct to the waging of war. Based on a close reading of many soldiers' newspapers, this volume is the first book to provide a historical survey of the U.S. military press from the Revolutionary War to the present. Drawing on the rich detail in the troop newspapers, the book also provides a social record of the attitudes, aspirations, and life of those engaged in war, and considers the increasingly controversial issue of freedom of the press in war time. Taking a chronological approach, the study opens with a consideration of the Revolutionary War and turns to a consideration of the Mexican War of 1846-1848 in chapter 2. The Civil War papers are covered in chapter 3. 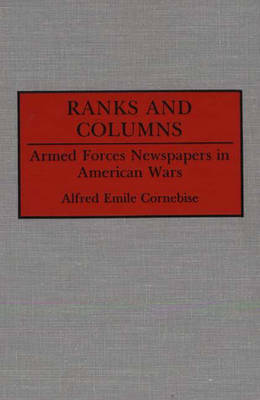 Chapter 4 discusses the period from 1865 to 1917, when the military press matured. The next two chapters cover the ground forces papers and the air service papers of World War I. Chapters 7 and 8 are devoted to World War II, and the final chapter covers the period since World War II. This volume should become a standard in journalism history.